I have no idea if this is a statistic or not, but if I had to guess what type of meat was most commonly grilled in the warm months, I’d guess it to be hamburgers, with hot dogs and sausage running a close second. I love a good burger, hot and juicy off the grill, with just the right amount of pink left in it to keep it flavorful. I’m pretty particular about my toppings too. In fact, a burger just isn’t the same without certain condiments, and if we are missing any it deflates my excitement a little bit. While I will eat a hamburger with certain things missing, I won’t touch a hot dog without exactly the right stuff. For me, that “stuff” is ketchup, pickles, tomato and onion. Yeah baby. And as far as burgers go, I swear by this sauce for the best ever burgers! There are lots of different ways to enjoy a burger, of course. 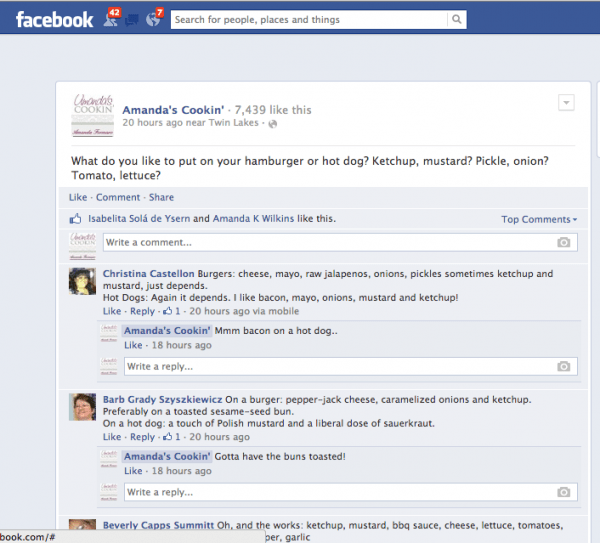 I asked on Facebook what you like to eat on your burgers and dogs. There were quite a few responses with condiments such as mayonnaise, mustard, jalapenos, and pepper jack cheese. And, even one adventurous answer that included peanut butter! 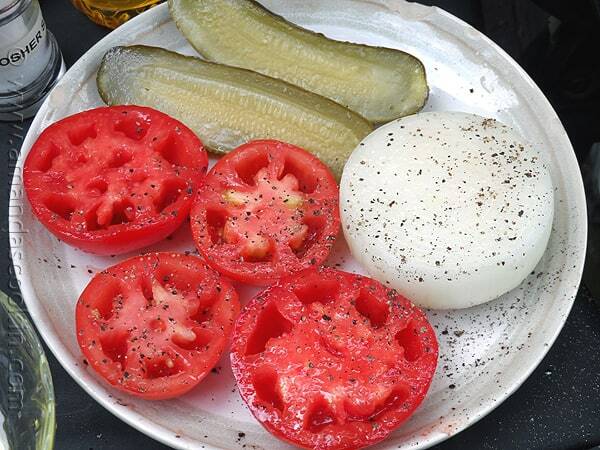 Usually, I slice tomatoes, cut my onions in rings, and cut dill pickles into round slices. 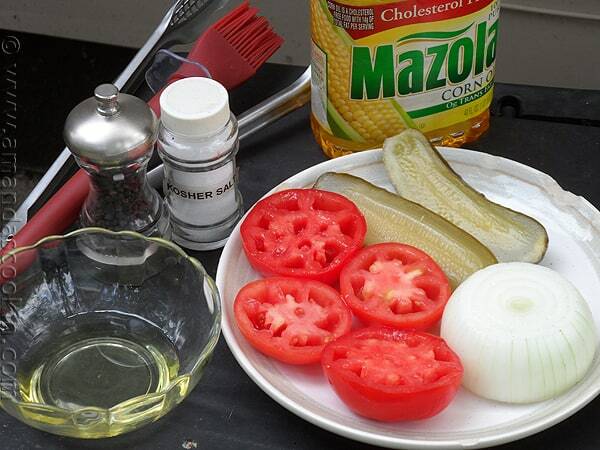 However, my friends over at Mazola challenged me to come up with a wacky recipe on the grill. Something that I may not have considered before, but would be fun to try, and above all else, successful and delicious. So I decided to grill my toppings! I decided to partner with Mazola, because of its heart healthy benefits. 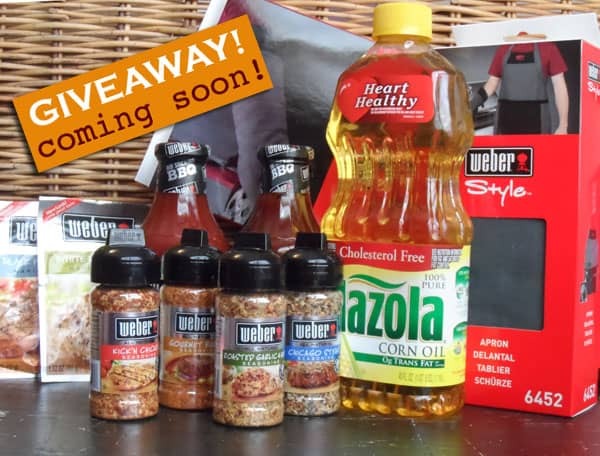 Mazola uses plant sterols in its cooking oil, making it a 100% cholesterol free source of unsaturated fat! it contains only 2 grams of saturated fat per serving! You can read plenty more in Mazola’s Health & Wellness section. So, back to my challenge recipe. 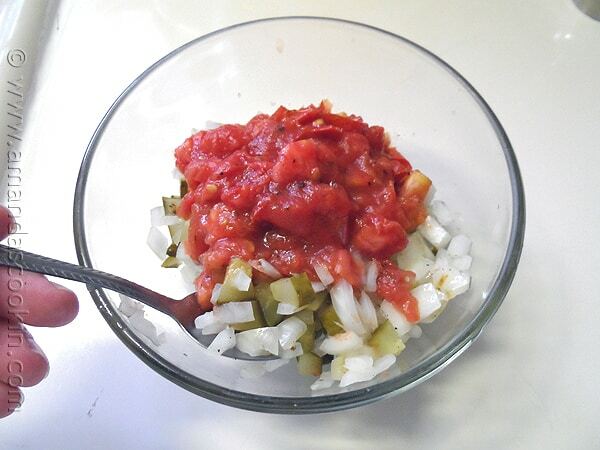 I was really pleased with how this relish turned out! There was a hint of roasted flavor from the tomatoes and the onions and overall, having the condiment warm went really well with the burger. 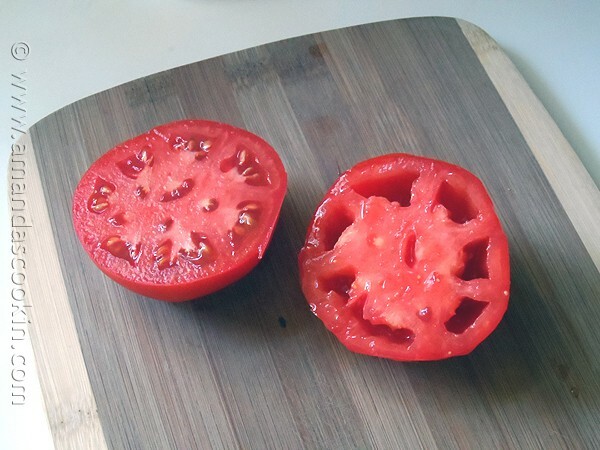 You want to start with nice ripe, yet still firm tomatoes. 2 medium tomatoes is enough. Use a knife to gently pick out the seeds and juice, but don’t squeeze them. Just remove whatever falls out. You will also need half of a medium white or yellow onion, and one dill pickle sliced in half. I use my homemade Claussen Pickles. 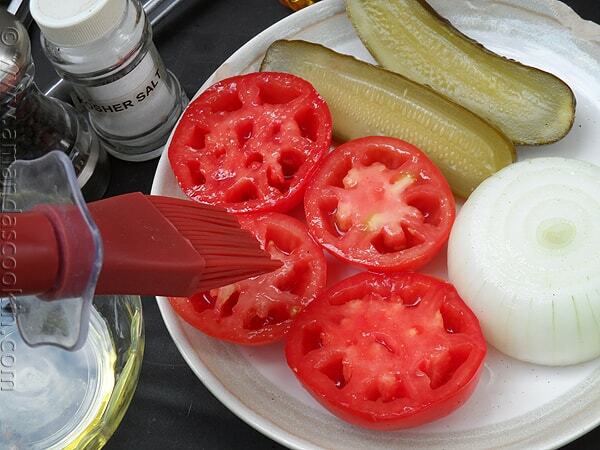 Grab your Mazola Corn Oil, a brush and some Kosher salt and freshly ground pepper. First preheat your grill, then turn down to medium heat. 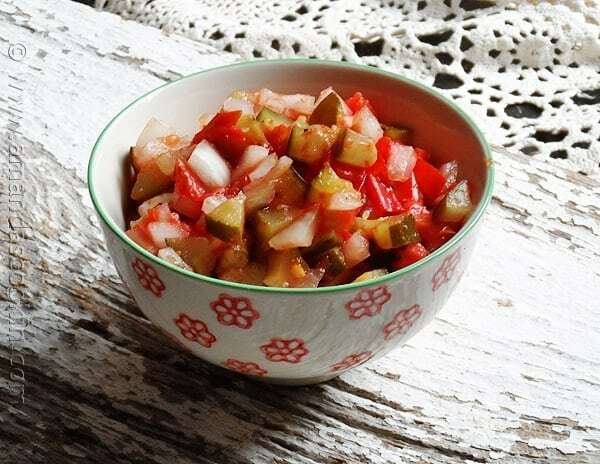 Brush the tomatoes, onion and pickle, both sides, with Mazola. 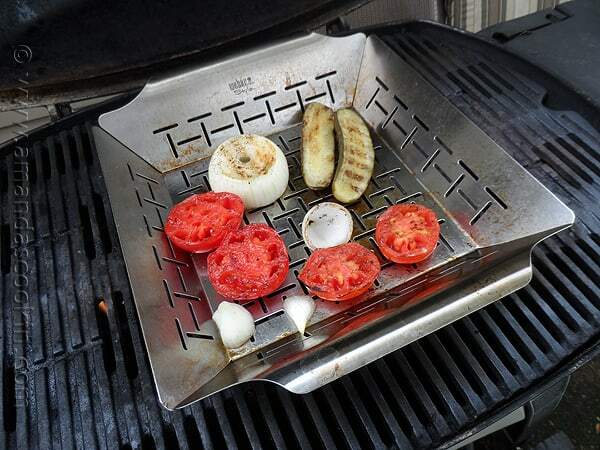 Brush a grill basket with Mazola and place on grill. Season to taste with salt and pepper, if you like. 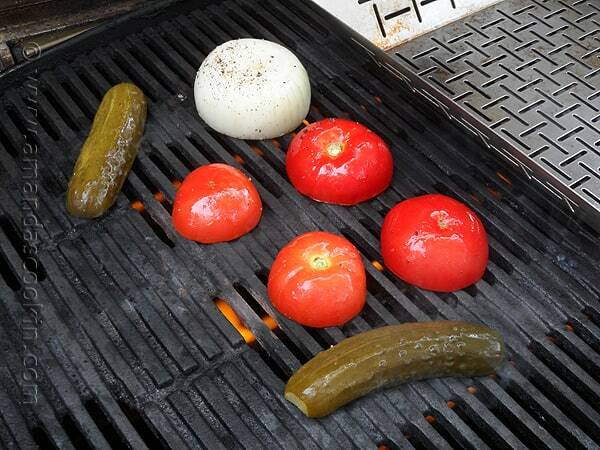 Start out by placing the tomatoes, onion and pickle cut-side down onto the grill. Allow them to cook until they have some nice grill marks going. Turn them over and grill on the other side. 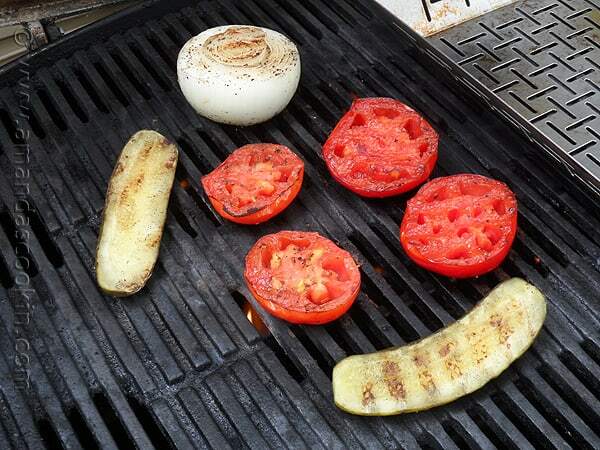 Place all the vegetables into your grill basket and place it at the far side of the grill, cooking for another 3-5 minutes. Cook your burgers. 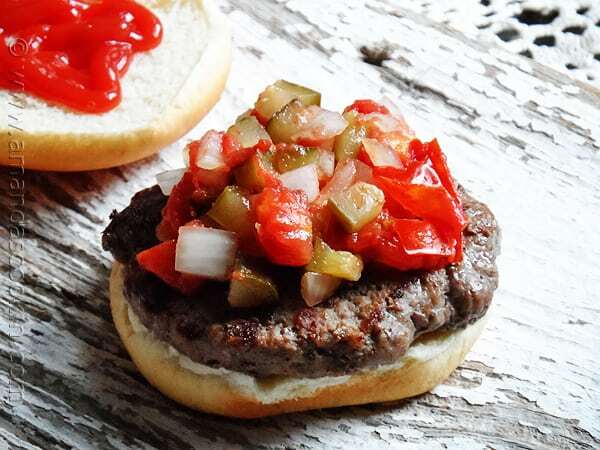 When you flip your burgers, take the vegetables off the grill and inside to be chopped. 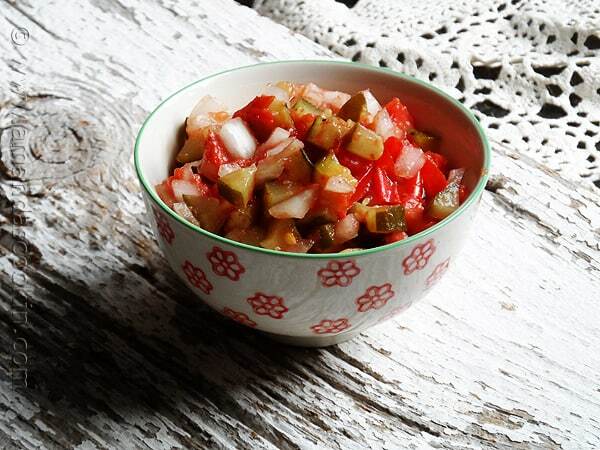 Chop the pickles and onions and combine in a bowl. They will be warm on the outside and still firm on the inside. The tomatoes will be roasted through. 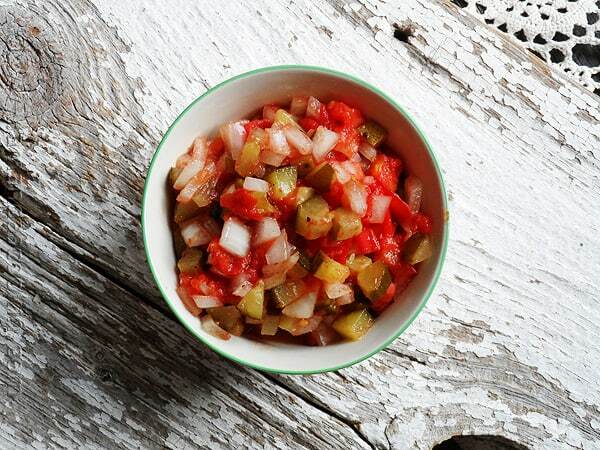 Cut or mash and combine with the pickles and onions. This is just a reminder that in the next few weeks I will be hosting a giveaway with all this bootie! So now that I’ve shared how I enjoy my burgers and dogs, what kind of toppings do you enjoy? 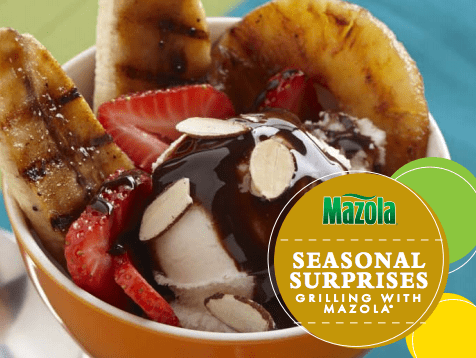 I have partnered with Mazola for a summer grilling challenge. While I have been compensated for the time it takes to prepare recipes and write posts, all of the opinions that I express here and completely my own. ooo turned out great, Amanda! Looks great to go with all the wonderful grilled foods of summer!! !